Lisa Dillon is looking for 200 talented new employees at Microsoft Inside Sales to add to the 500 already hired this year at the company’s brand-new EMEA Inside Sales Centre in Dublin. The Dubliner, who joined Microsoft as MD of its EMEA Inside Sales Centre in July 2016, has overseen a fast-growing workforce, which, by the end of 2017, will constitute a team of 700 people serving customers in over 60 countries and 37 languages. Lisa herself, who holds an MBA from Trinity College along with degrees in electronic engineering and mathematics from the same institution, is a poster-child for female involvement in STEM – but, she says, when Microsoft started to search the market for potential employees in these pre-sales and solution sales roles, females made up just 12% of the available talent pool. 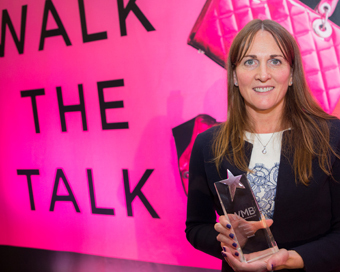 “To me it would be an ideal world if it was 50/50,” comments Lisa who was recently presented with the WMB Businesswoman Award 2017. “My father had a lot of women and men in his workforce, and he made a point of mentoring a lot of women who are very successful today. “He was very encouraging to women,” recalls Lisa, who is a board member of Enterprise Ireland and also holds positions on a number of Inside Sales industry bodies. “In school my favourite subjects were maths, applied maths and science – I loved them,” she says – this was partly because she found them so intensely interesting, and partly, she quips, because there’s always a right or wrong answer in STEM. “I really loved working there; you got a handle on everything. As general manager of the whole business I was responsible for all the functions within ESAT Net.” Next stop was Oracle, where Lisa stayed for more than 13 years, working primarily in the Inside Sales area based in Dublin but operating in markets across Europe. “In this new role, I have had the opportunity to be involved in everything from the design of the organisation, to how many people would be based there, and work very closely with colleagues in the USA,”. Last February, Lisa, who also holds a Diploma in Life and Business Coaching and a Diploma in Company Direction, formally announced the new EMEA Inside Sales organisation and the creation of 500 jobs. Those positions are now filled.